This classic early summer flavor combination — radishes with salted butter and fresh bread– is inspired by my recent visit to Bumbleroot Organic Farm, where Ben and Melissa were harvesting radishes to bring to the Portland Farmers’ Market the next day. It’s the simplest meal, and can be as casual (rustic hunks of bread) or elegant (tiny tea sandwiches) as you like. I like to use the crusty, wood-fired country french bread from Tinder Hearth Bakery, but the bread possibilities are endless. Try spelt, rye, whole wheat or small baguette slices! This is the kind snack or lunch you can make right at the Farmers’ Market or sitting outside your neighborhood market, as long as you have a knife. Happy Summer! Slather butter onto bread thickly, adding salt to the butter if you’re using unsalted. 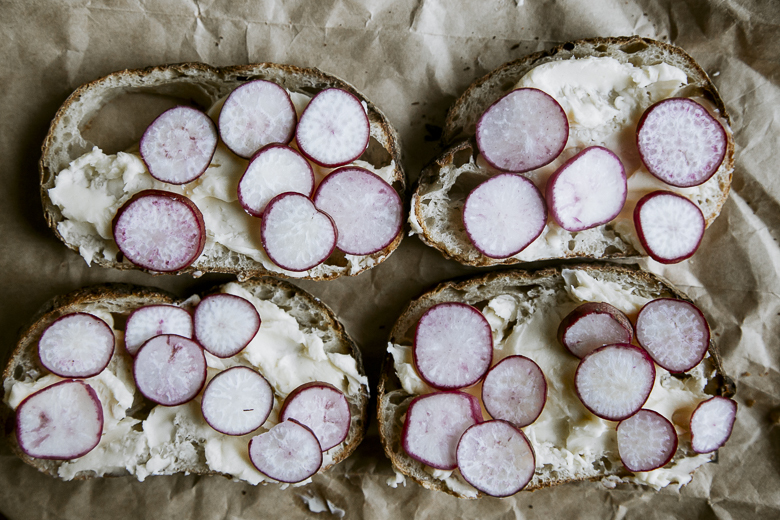 Slice the radishes thinly and arrange on each buttered slice of bread.